For the rest of their lives, they will remember what occurred on Feb. 27, 2017. At a sold-out Palestra – the traditional Mecca of local hoops – Cardinal O’Hara won the girls’ Catholic League basketball championship. On one hand, that’s simply a factual sentence. That they defeated defending champion Archbishop Wood, 35-30, is obviously integral to the full story. 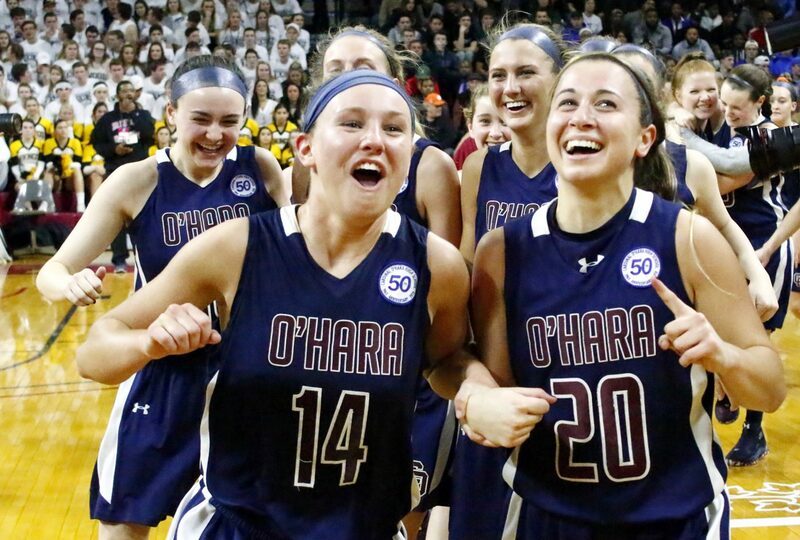 However, it’s that combination of words – “Cardinal O’Hara won the girls’ Catholic League basketball championship” – that continues to marinate in the players’ collective mind and heart. It’s not that O’Hara doesn’t know success. If anything, it’s been the Catholic League’s most successful program over the past two decades – with 10 league titles over the past 20 years. It’s that this year’s team – solid, but flawed throughout the regular season – threaded three phenomenal games in the postseason to accomplish what seemed unlikely at best and impossible at worst. A 62-36 quarterfinal victory over Lansdale Catholic preceded a stunning, highlight-reel 57-42 win over heavily favored Neumann-Goretti in the semis. That the Lions could muster enough gumption to avoid the negativity of naysayers and outplay a tremendous Wood team that had not lost a league game all season is simply remarkable. Although a career effort by junior Maura Hendrixon (10 points; two clinching free throws with seven seconds remaining) proved pivotal, orchestrating O’Hara’s usually patient offense was senior Hannah Nihill. The Drexel University-bound point guard pestered Wood’s thoroughly capable backcourt all game long, scored a game-high 13 of her team’s 35 points, and drained three key free throws down the stretch. During an impromptu post-game interview, Nihill stressed that every player needed to accept her assignment with unselfish, reckless abandon, whether that be snaring a rebound, boxing out, dishing off to an open player, or verbally expressing support from the bench. Three days later, her palpable verve remained. Kenzie Gardler, a junior guard who plays with the proverbial ice water in her veins, described the surreal experience with typical aplomb. And “Pla Pla” will say hello right back. Couldn’t happen? That’s what people said about Cardinal O’Hara’s chances of winning the girls’ basketball championship. The Cardinal O’Hara girls’ basketball team exemplifies what ‘TEAM’ is. I mean if you had to coach against them, what one or two players do you focus on? The starters all can shoot from the inside and from beyond the arc. They all can play defense and hustle their hearts out and dive for loose basketballs. They are talented, unselfish, and remain humble and most pleasant. Above all, they are exceptional peer role models and demonstrate what one looks for in a student-athlete.